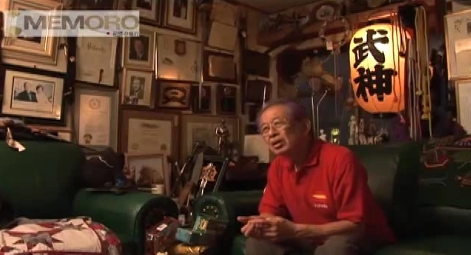 I went looking for information about the Daikomyosai on Joji Ohashi’s website and came across some links to an incredible series of interviews with Hatsumi-sensei on Memoro, a Japanese oral history website. It is unfortunate that these interviews are all in Japanese because some of the things that Hatsumi-sensei is discussing are quite personal in nature and deserve a broader audience. For example, in the first of the series, when asked about what drew him to martial arts, Hatsumi-sensei reflects on the fact that his father used to get violent around the home, and that out of necessity, Hatsumi-sensei had to learn to take away any objects that his father might be swinging about and to be able to “put him to sleep.” Wow! That is not normally what one talks about on camera to be shown to the world…and preserved for prosperity. I am certain that if the same interviews had happened thirty years ago, the quality of the answers would have been vastly different. It is clear that Hatsumi-sensei took this interview very seriously. Hatsumi-sensei is reflecting on the lessons of his rich life; the honesty of his answers is humbling. I hope that someone has time to provide a more detailed translation at some point in the future. This last weekend (May 15-16), the Muzosa Dojo was kind enough to bring Luke Molitor back to NYC for Part II of his wonderful sword seminar series. I will begin by saying that I am biased toward Luke; we used to the knock the crap outta each other during training at both Nagato Dojo and Hatsumi-sensei’s training. He’s a good friend. He also happens to be a terrific budoka and the most skilled swordsman in the Bujinkan among the non-Japanese, in my opinion. Luke has gotten frighteningly good at sword, and there are many lessons to be had in that…. First, Luke’s skill did not improve because he was living in Japan. It improved because he actually practiced once back in America what his teachers had shown him in Japan. It is clear that Luke does not just do a “Back from Japan” seminar one week and then return to doing what he was doing before his Japan trip. There is no way Luke could have gotten as good as he has gotten by following that prescription. I knew Luke’s budo very well when I left Japan in 2000. I had felt his shuto many a time. His time spent with the sword has added a new dimension to his budo, and I am extremely happy to see that progress. Luke could always generate power, my jaw recalls fondly. But the way he generates power today is in a totally different league. Luke owes that growth to his work with the sword, in my opinion. Second, everyone in the Bujinkan should attend one of these seminars with Luke. I don’t care who you are, how many years you have been practicing, or how good you think you are. There is no one in the Bujinkan who could not learn something from Luke in this seminar. 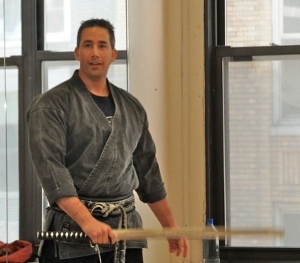 At the urging of his students, Luke has broken down some of the key lessons of swordwork within the Bujinkan, and he basically serves those lessons on an all-you-can-eat platter of Tasty Budo. Do your best to attend one of these seminars. Third, just because you attend does not mean that you will “get it” during that seminar. In fact, most of the people in attendance really had no idea what Luke was doing. But that’s not necessarily a bad thing. That means there is still room for growth! And that is, after all, the reason you are attending the seminar in the first place. At one point during the seminar, one of the practitioners behind me was swinging his sword quite forcefully. I turned to him quizzically, wondering what was up. He looked at me and said, “I’m trying to make the sword whistle like Luke.” To which I responded, “You won’t be able to make it whistle for at least another year. Get the mechanics instead first.” And that presumed that the practitioner was actually going to practice religiously what Luke was showing that day. The last time that Luke was in town (for Part I of his seminar series last summer), our dojo spent six straight weeks working on what Luke had shown. It was a collective effort to try to reconstruct the lessons of the seminar, and we relied on the fact that each person was going to take away part of the puzzle and together we might be able to reassemble it. In the end, we worked on the material until we came to a point where we could not go any further without starting to make stuff up. When you get to that point, it’s best to simply stop…and to get more on which to work from the teacher—in this case, Luke, who had been scheduled to return to NYC later that summer, but ended up having to cancel. Still, those six weeks were a worthwhile investment, as we were able to follow along this time around with a bit more ease. We plan to work on the newest material in a similar fashion again. Hopefully, we can improve by the next time Luke hits the Big Apple. Thanks for a great seminar, Luke! We look forward to the third installment next time around.